Stuffed chilis can take on many forms. The small ones known as “poppers” are very popular as an appetizer. Preparing them can be a bit time-consuming, but is well worth the extra effort. They taste nothing like the frozen ones you buy in a supermarket. Rellenos historically are stuffed and baked Poblano peppers. The concept here is the same, only bite-sized and deep-fried. (Atkins participants need not apply.) Years ago, I had the opportunity to sample some called “Banditos” at a streetcorner ice-cream shop in downtown Denver. They were the hottest damn jalapeños I have ever had. They served them floured in a french-fry basket with sour cream on the side. Good eats! Wash peppers. Leave the stems on. Cut horizontally about a third of the way through the pepper near the base by the stem. Next, make a vertical slit running from this cut down the length of the pepper. The result should look like a T-shaped slit on only one side. Carefully pry open the wall with a slender paring knife and snip out the membrane and seeds. Doing this takes a little practice. Wash out the rest of the seeds with cold water. Prepare two large plastic storage bags with flour and bread crumbs, respectively. Fill a coffee cup full of milk and another with three beaten eggs. Place aside. In a mixing bowl, combine the cream cheese and shredded cheese. Microwave for 20-30 seconds until just softened. Mix well with spoon. Carefully stuff each pepper with the cheese mixture. A butterknife works well for this. Gently press the sides of the pepper back together around the cut and wipe away any excess cheese. Now comes the fun part…. dunk one pepper in milk, then drop it into the flour bag and shake. Remove and then place in egg cup, being sure to evenly coat all sides of the pepper. Remove from egg and toss in breadcrumb bag. Repeat the egg and breadcrumb step for a thicker batter. In case you’re wondering, the milk is a binding agent… without it, the batter would slide right off the pepper when placed in the deep fryer. Peppers can also be arranged on wax paper and sealed in an airtight container in the fridge overnight if needed. Make a batch the night before, then deep-fry them when you need them. Heat a deep cast-iron pan filled with vegetable oil on medium-high. Drip a small amount of water in the oil. If it sizzles, you’re ready. Using a long pair of tongs, carefully set 5-6 peppers in the oil and brown for about three minutes, turning once. Do not crowd the pan as the temperature of the oil will drop. Remove peppers, drain on paper towels and serve with sour cream, salsa or guacamole. CAUTION: FILLING WILL BE EXTREMELY HOT. LET COOL FOR A FEW MINUTES BEFORE SERVING. This is a fantastic, healthy and quick meal to prepare. Make sure that your wok is preheated until it’s blistering hot – ensuring that the flavors are seared quickly. In a pinch you can use snow peas or even asparagus. Most indoor ranges cannot put out enough heat for a proper stir-fry. I use my cast-iron Lodge wok on my 22″ outdoor Weber charcoal grill. It works great and eliminates the need for an expensive, high-BTU output propane burner. Prepare the beef marinade by trimming the beef and placing it in a ziplock storage bag. Combine 1/4 cup soy sauce, the juice of 1/2 lemon, 1 tsp. hot chili sambal paste and three cloves mashed garlic. Stir well to incorporate and add to the bag. Seal, shake it well and let sit in your fridge for at least two hours. Prepare the vegetables and place in a bowl so you have them ready to go. Mix the two tbs. corn starch and 1/4 cup cold water in a small dish and set aside. Mix two tbs. soy sauce and the beef broth and set aside. Everything should be brought up to room temperature before being placed in the wok. Ensure that your vegetables are patted dry. Wet vegetables will create soggy food. Prepare an outdoor grill with enough charcoal for a very hot fire, using direct heat. The mound of charcoal should touch the bottom of the top rack when placed on the grill. 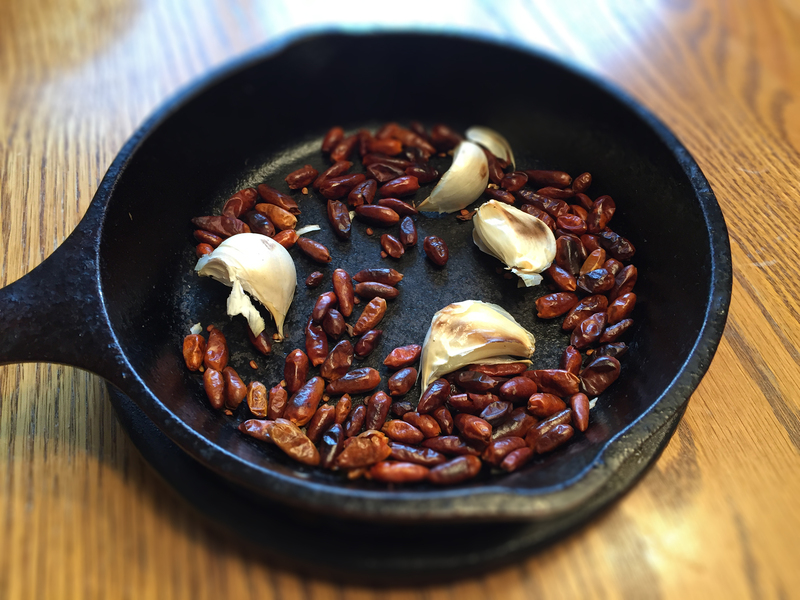 Lightly wipe down the surface of the cast-iron wok with peanut oil and place on the grill when the coals are nearly white-hot. The wok will be hot enough when a drop of water vaporizes instantly. Have a covered serving dish, two silicone spatulas, a meat tongs, oven mitts and a Chinese-style spider-strainer ready. This meal will be done in under four minutes. Have all other ingredients at the ready. Combine the corn starch mixture and the beef broth and stir one last time to incorporate. OK, are you ready? Add the two tbs. peanut oil to the wok and swirl quickly to coat the surface. Immediately add the ginger/garlic and quickly stir-fry for about thirty seconds until just aromatic. Immediately add the beef using a tongs (marinade should be drained off.) Quickly stir-fry until no longer pink, but not thoroughly cooked. Remove the meat with a spider-strainer and set aside in the covered serving dish. Add the vegetables and stir fry for about two minutes until just crisp-tender. This part is critical. If you cook them too long, they will be overdone and soggy when the beef is recombined in the next step. Add the beef back to the wok, combine and add the sauce mixture. Heat until it thickens, about thirty seconds to one minute. Add the sesame oil and combine. Remove the wok from the grill and transfer the stir-fry to a covered serving dish. Serve with steamed rice. Take advantage of your outdoor grill during summer months by adding incredible flavor and depth to this unique salsa. Enjoy! It’s well worth the extra effort. Prep the vegetables. Let the corn soak in cold water for at least an hour. When the coals are white hot (use direct heating method), place the corn cobs with husks on the grill and cover, rotating for about 45 minutes until slightly charred. During this time, keep the corn moist by adding a small amount of water over the cobs after turning. Remove and set aside to cool. Check the temperature of your fire and re-stoke if necessary. Working quickly, place the poblano pepper, the tomato and onion planks to the grill. 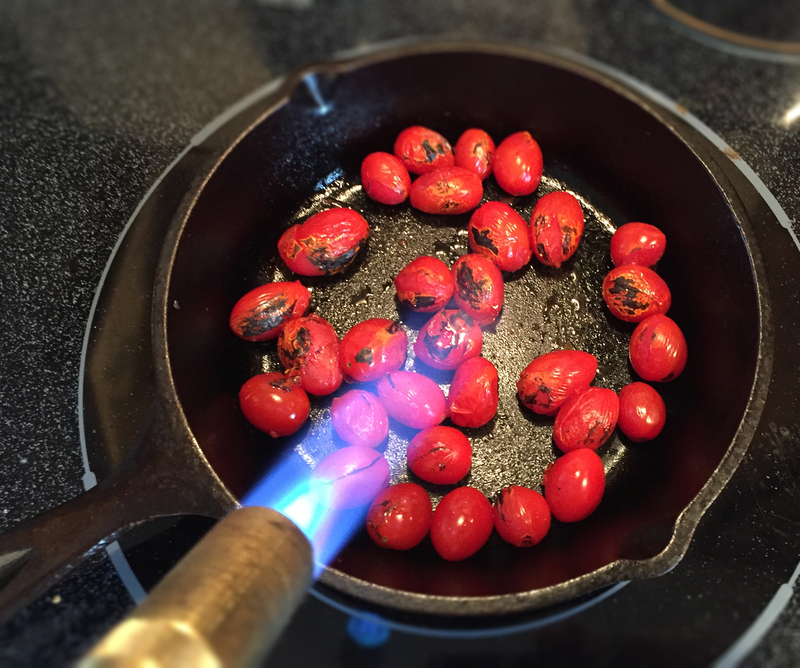 Brush with olive oil and allow to char evenly. Rotate to avoid overcooking. When done, remove and place the poblano pepper in a sealed paper bag. Allow to stand for 15 minutes. The pepper’s tough outer skin will sweat and blister off. Cut the kernels off the cobs and place the corn in a bowl. 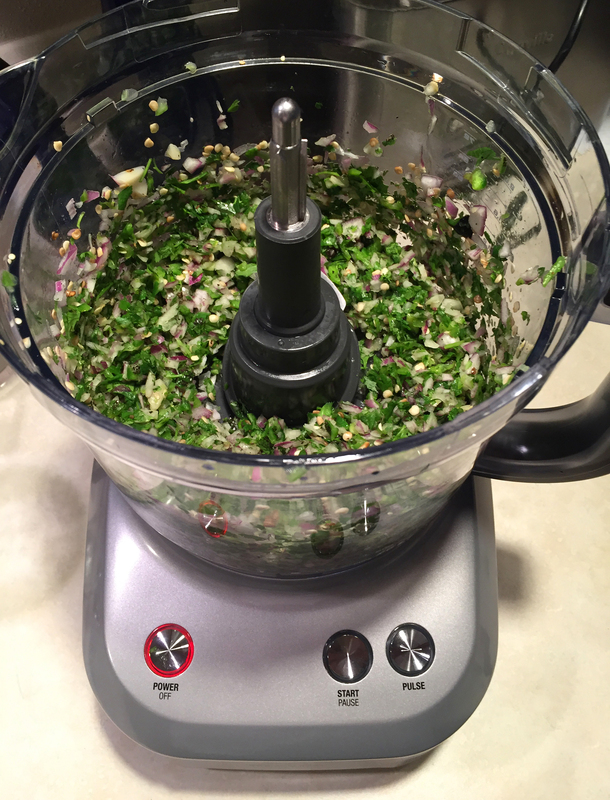 Add the salt, lime juice and minced cilantro. Dice the skinned poblano, tomato and onion. Add to the bowl. Add the minced serrano pepper. Use the serranos to control the heat to your preference. Add the black beans (about a cup), and the garlic. Stir well. Allow to sit for at least 1/2 hour, taste and correct the seasoning if necessary. Serve and enjoy! I highly recommend blue corn chips with this recipe.